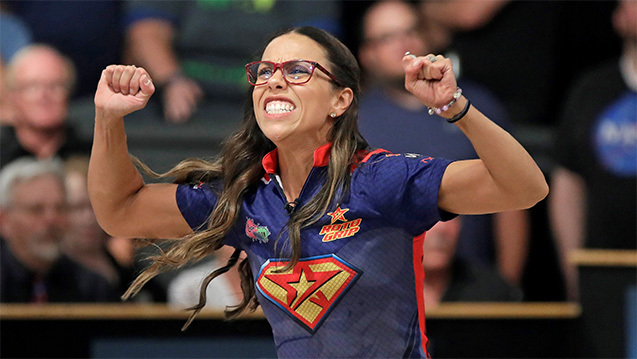 EAGAN, Minn. - Although the road to the season-ending Professional Women's Bowling Association Tour Championship may have had more bumps than planned in 2018 for Colombia's Rocio Restrepo, she returned to form Saturday on the way to winning the BowlerX.com PWBA Twin Cities Open. "I knew I needed to bowl really well against Liz, since she had been phenomenal all week," said Restrepo, who now resides in Louisville, Ohio. "The left lane had been giving the other girls trouble, but since I made the decision to use a different ball from the beginning, I was able to play them the same." "I saw the same thing this morning," Restrepo said. "Some of the pairs had the left lane playing tighter and the right lane hooking more, and on the show it felt like they played a lot tighter. I knew I needed to use something stronger just because of how the lanes were playing compared to earlier in the week, and I just tried to stay loose and make sure I could swing it to the right." At last week's Pepsi PWBA St. Petersburg-Clearwater Open, travel issues caused her to miss the first round of qualifying after competing for Colombia at the Central American and Caribbean Sports Games in Barranquilla, Colombia. Although she's still working to get back to where she'd like to be on the lanes, Restrepo now is ready to take advantage of the rest of the season. "I know my physical game is not 100 percent yet," Restrepo said. "I know there are a lot of things to work on in the next few weeks, but I'm looking forward to competing (at the Tour Championship). Last year, I didn't perform as well as I could have, so I want to have fun and make the best of the venue we have there." Kuhlkin had led every round leading up to the stepladder finals and made her third consecutive appearance on CBS Sports Network after winning the U.S. Women's Open and placing third last week at Seminole Lanes in Seminole, Florida. The 24-year-old right-hander trusted her next move after making the ball change in the fifth frame and hopes to continue the momentum she's found in the second half of the season. "I felt really good about the ball I started with, but I was confident in moving down to the next ball after leaving the 3 pin in the fourth frame," said Kuhlkin, a two-time PWBA Tour champion. "Rocio was looking good, and I wasn't going to wait because I'm out here to win. I made the right change and made some great shots. I honestly thought I made the spare. Off my hand, I felt pretty good about it, but it caught some of the oil downlane and pushed. Those things happen, and all I can do is continue to put myself in position to win." Restrepo was able to stay clean after an early open frame, while Richard, who's the leading candidate to claim PWBA Rookie of the Year after capturing the win at the PWBA Greater Harrisburg Open, had back-to-back open frames on the left lane to end the match. Richard bested the front runner for PWBA Player of the Year, Shannon O'Keefe of Shiloh, Illinois, to advance to the semifinals, 197-192. Richard bounced back from a missed 4 pin in the fourth frame to put the pressure on O'Keefe in the 10th. O'Keefe, a two-time winner this season, needed a double in the final frame to move on, but she left her third consecutive 10 pin to finish in fourth place. The BowlerX.com PWBA Twin Cities Open is the second of three elite-field events taking place in August. Following the U.S. Women's Open, the top 24 players on the PWBA points list earned their way into the elite-field events with the remainder of the 32-player field determined through a pre-tournament qualifier (PTQ).